The fourteen essays that comprise this volume concentrate on festival iconography, the visual and written languages, including ephemeral and permanent structures, costume, dramatic performance, inscriptions and published festival books that ’voiced’ the social, political and cultural messages incorporated in processional entries in the countries of early modern Europe. The volume also includes a transcript of the newly-discovered Register of Lionardo di Zanobi Bartholini, a Florentine merchant, which sets out in detail the expenses for each worker for the possesso (or Entry) of Pope Leo X to Rome in April 1513. 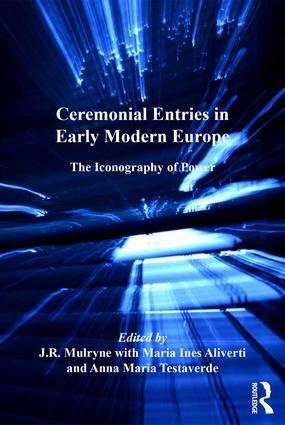 Introduction: Ceremony and the iconography of power, J.R. Mulryne; The theme of war in French Renaissance entries, Richard Cooper; 'Concernant le service de leurs dictes Majestez et auctorité de leur justice' perceptions of royal power in the entries of Charles IX and Catherine de Médicis (1564-1566), Linda Briggs; Henri IV as architect and restorer of the state: his entry into Rouen, 16 October 1596, Margaret M. McGowan; Warrior king or king of war? Louis XIII’s entries into his Bonnes Villes (1620-1629), Marie-Claude Canova-Green; ‘Entrate, onoranze, esequie et altre cose’: the book of ceremonies of Francesco Tongiarini (1536-1612), Anna Maria Testaverde; Re-moulding the city: the Roman possessi in the first half of the 16th century, Lucia Nuti; Theories of decorum: music and the Italian Renaissance entry, Iain Fenlon; The grand entry of Elizabeth of Valois into Spain (1559), Julia de la Torre Fazio; Elements of power in court festivals of Habsburg emperors in the 16th century, Veronika Sandbichler; Ephemeral architecture in the service of Vladislaus IV Vasa, Jacek Żukowski; The iconography of populism: waterborne entries to London for Anne Boleyn (1533), Catherine of Braganza (1662) and Elizabeth II (2012), Margaret Shewring; The Golden Fleece of the London Drapers’ Company: politics and iconography in early modern Lord Mayor’s shows, Sara Trevisan; Enter the alien: foreign consorts and their royal entries into Scottish cities, c. 1449-1590, Lucinda H.S. Dean; A survey of recent research on Renaissance festivals in the German-speaking area, Andrea Sommer-Mathis; Appendix;Index. J.R. Mulryne is Emeritus Professor, University of Warwick, UK. Maria Ines Aliverti formerly Associate Professor in the Department of History of Art at the University of Pisa, Italy. Anna Maria Testaverde is Associate Professor of Theatre History at the University of Bergamo, Italy.